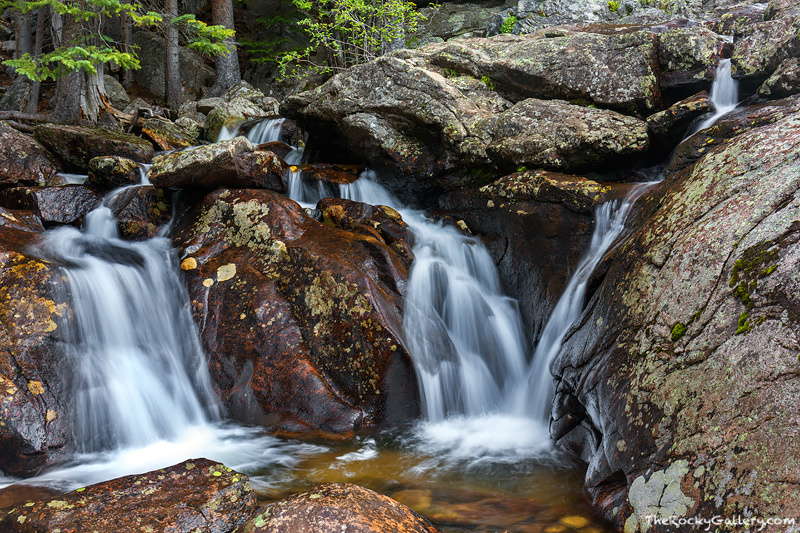 Located along the North Inlet on the west side of Rocky Mountain National Park is Cascade Falls. By Rocky Mountain National Park standards Cascade Falls is a fairly large and complex waterfall which tubles and cascades through a series of drops, offshoots and pathways. Photographing Cascade Falls can be a bit of a challenge because it is so large and dispersed. I prefer to concentrate on photographing the more subtle side of the falls. Here three seperate cascades make their way downhill towards Grand Lake and the Colorado River. Photo © copyright by Thomas Mangan.